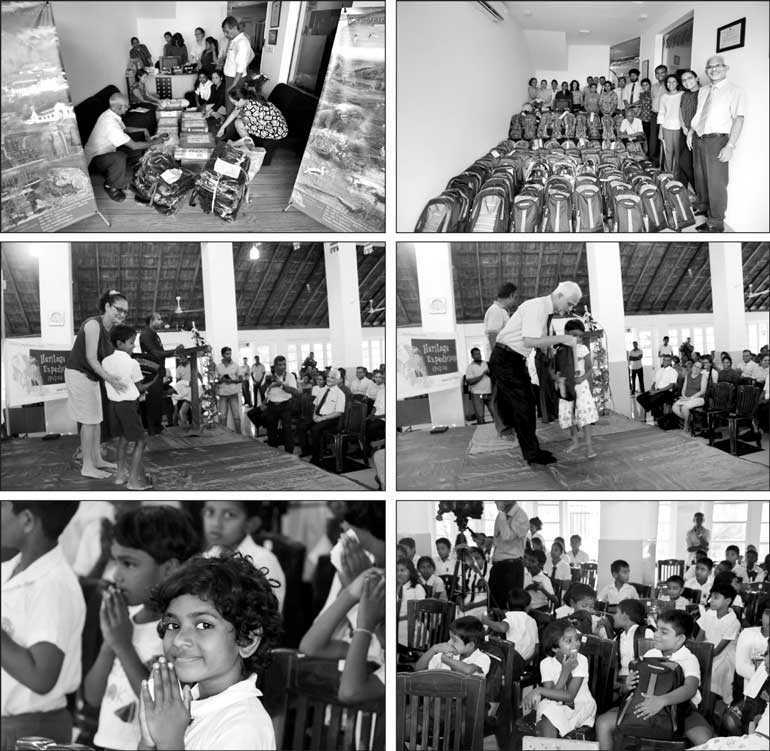 Heritage Expediciones recently conducted a new high-profile CSR program on 5 December 2018 at the Galvana Purana Rajamaha Viharaya in Mulleriyawa. This was at the request of W.K. Thusita, the Coordinating Secretary of the Tikiri Kumara Eksath Subasadhaka Society, and the program was to assist and uplift educationally, 73 students of 502, Udumulla Grama Niladhari division at Lake Road, Mulleriyawa. These residents suffer immense hardships and are continuously inundated during the rainy season as a result of the rapidly rising Kelani River, thus disrupting their daily chores and the studies of these poor aspiring youth. It is at this point that Heritage Expediciones Ltd. immediately stepped into alleviate and fulfil some of the urgent requirements of these unfortunate children in the area of education. Heritage Expediciones is a family owned business, and has always been committed to helping needy families, uplift their living conditions and thereby contribute to the betterment of society. This husband and wife duo from Heritage Expediciones put all their working commitments on hold and personally visited 502 division on 24 September 2018 to assess the ground situation at Mulleriyawa and saw for themselves the squalid conditions these children and their families were exposed to. Their thatched makeshift wooden structures they called home, and their poor living conditions. After a brief chit chat with these residents, they assessed their immediate needs and galvanised their staff in to action to source and secure these necessities, which included school bags and stationery items. This was coordinated and organised by W.K. Thusita. This was not just another CSR project but a very personal and caring endeavour that goes beyond them and the organisation, with much of their efforts and resources being directed towards giving back as much as possible to society and the community as a whole irrespective of cast or creed.